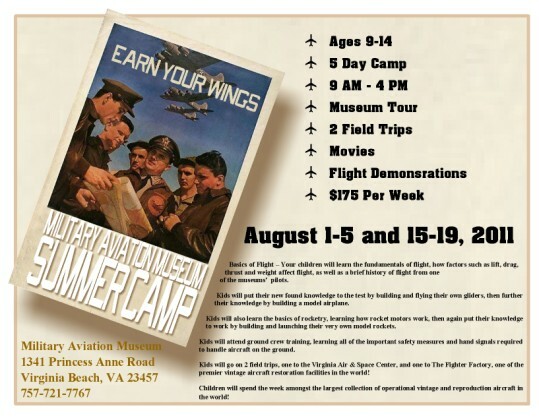 The Military Aviation Museum is excited to hold its very first “Warbirds and Wings” Aviation Summer Day Camp August 1-5 and August 15-19 of this year. During this fun-filled learning experience, your children will spend the week at the Virginia Beach Airport amongst one of the largest private collection of operational vintage and reproduction aircraft in the world! They will have the thrill of being up close and personal to vintage World War I and World War II era fighters, bombers, trainers, and seaplanes and learning about them, as well as general aviation. Children will enjoy 2 field trips throughout the course of the week, one to the Virginia Air & Space Center, and one to the Museum’s own, Fighter Factory. In the Factory, they will get to see first-hand how these magnificent flying machines have been beautifully restored to their former glory and can observe and talk with the mechanics who make them soar again. The final day will be marked with demonstration flights of several of the museums restored aircraft, a picnic, with games and prizes. This promises to be quite the experience any young aviator won’t want to miss! The 5 day Camp will be for Children ages 9-14 years old and will be held from 9:00am to 4:00pm, the cost is $175 per child per camp session. Extended Hours are available for an additional fee. AM Extended Hours are 8 AM-8:45 AM for $25 per day, PM Extended Hours are 4 PM-5:30 PM for $50 per day. An overview of WWI and WWII military aviation, aviation mechanics, aviation restoration, and the fundamentals of flight; how factors such as lift, drag, thrust and weight affect flight, as well as a brief history of flight from one of the Museum’s own pilots. How to building and fly their own gliders, and then further their knowledge by building a model airplane. The basics of rocketry, learning how rocket motors work, then again put their new found skills to practice by building and launching their very own model rockets. About ground crew training, learning all of the important safety measures and hand signals required to handle aircraft on the ground will also be a part of this week’s agenda.